Thank you for spending 2016 with me! I appreciate every single follower I have gained and it’s because of you, that I continue to blog about beauty. I’ve met so many people and had so much fun interacting with you. Here’s to another year of great products and new/continued friendships! Speaking of great products, I have the first of 2017! 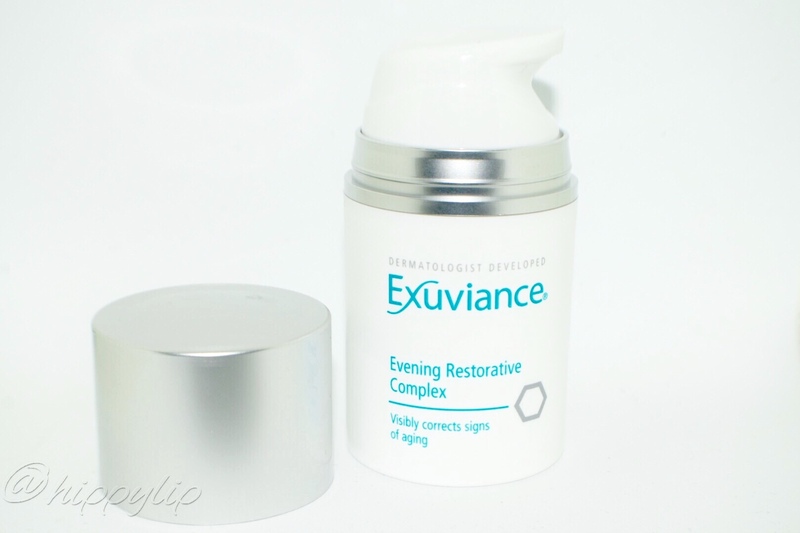 Exuviance Evening Restorative Complex, is a night time anti-aging face treatment developed by NeoStrata. NeoStrata is located in Princeton, NJ and markets a wide range of dermatology developed skin care brands including NeoStrata, Exuviance, CoverBlend, and Psorant. Lactobionic Acid – a potent antioxidant – helps inhibit wrinkles from forming, plumps and firms the skin, and enhances clarity. A potent complex of anti-aging ingredients and beneficial botanicals in a powerful solution to care for photo-damaged, aging skin as you sleep. This night time treatment cream effectively combats visible signs of aging and is clinically proven to repair signs of aging. Acid (PHA) Gluconolacctone: targets lines and wrinkles, evens skin tone and improves roughness and texture. Lactobionic Acid: a potent antioxidant that helps inhibit wrinkles from forming, plumps and firms the skin, and enhances clarity. Hyaluronic Acid: restores youthful suppleness and elasticity. Botanicals and Vitamins A, C and E: delivers anti-aging benefits without drying or irritation. 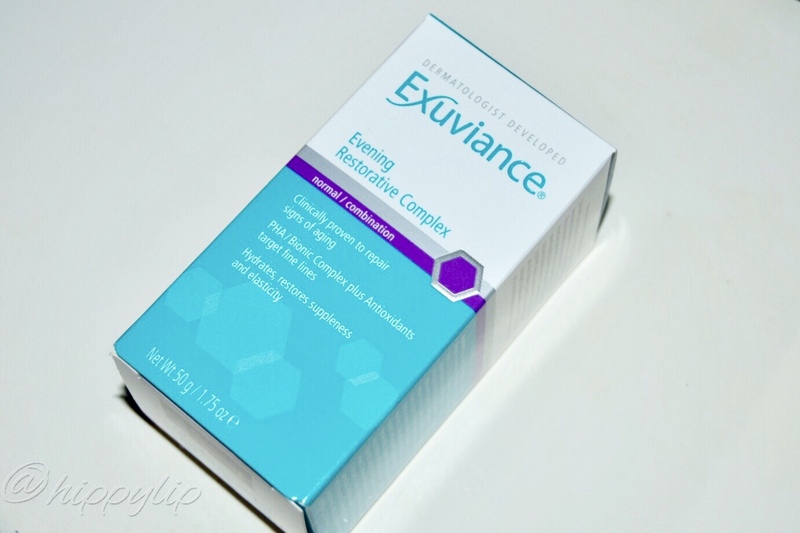 Exuviance Evening Restorative Complex couldn’t have arrived at a better time. Occasionally my skin gets red and feels really rough and I was in the midst of one of these strange attacks when it arrived. I believe it’s allergy related but that is a total guess. This nighttime treatment is housed in a plastic container with a pump style dispenser. The very first thing I noticed was the scent, this cream smells amazing! It has an apple citrus scent that is just light and fresh, I really can’t get enough of it. The texture is thick and creamy with a light green color. The pump dispenses a pretty large amount so I suggest starting with a half pump. Even though the consistency feels thick, it glides on extremely smooth. What really surprised me was that I had no tingling, burning, flushing, or redness. 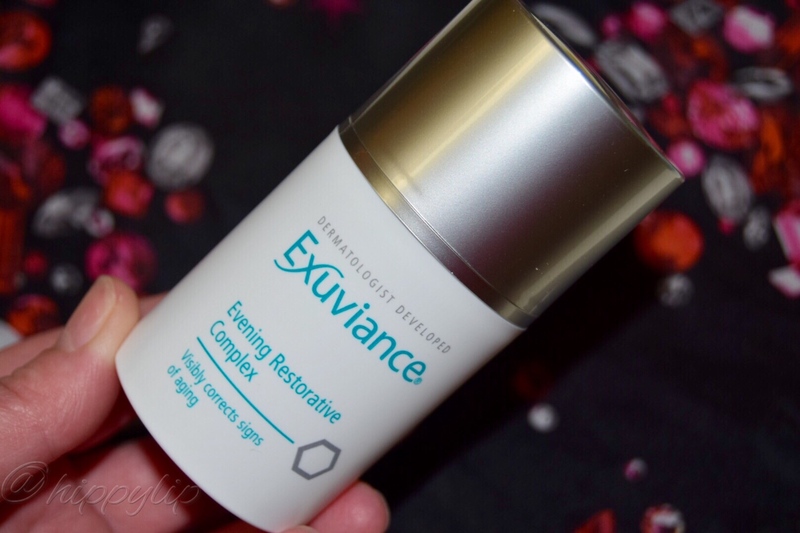 Exuviance Evening Restorative complex feels so gentle, even super sensitive skin could benefit. 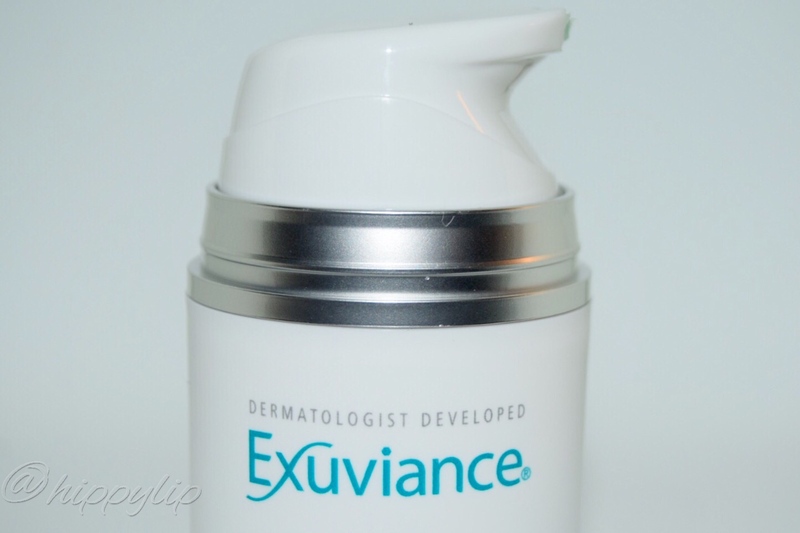 I have been using this treatment every night for 2 weeks and my skin loves it. The moisture sinks right in and doesn’t leave any oily residue. The first noticeable changes happened in one week. My face feels extremely smooth, fully moisturized, and it’s slightly more firm in the crepey areas. You get 1.75 ounces for $48 USD. Not a whole lot of product for the price but my skin is important to me so I will splurge. I am getting really positive results and it feels luxurious on my skin. I am excited to see what happens at the 4 week mark and will update this post with any results. Until then I will #sleeponit. Disclosure: This is a sponsored post. I received this product in exchange for an honest review. All opinions are my own and 100% honest. 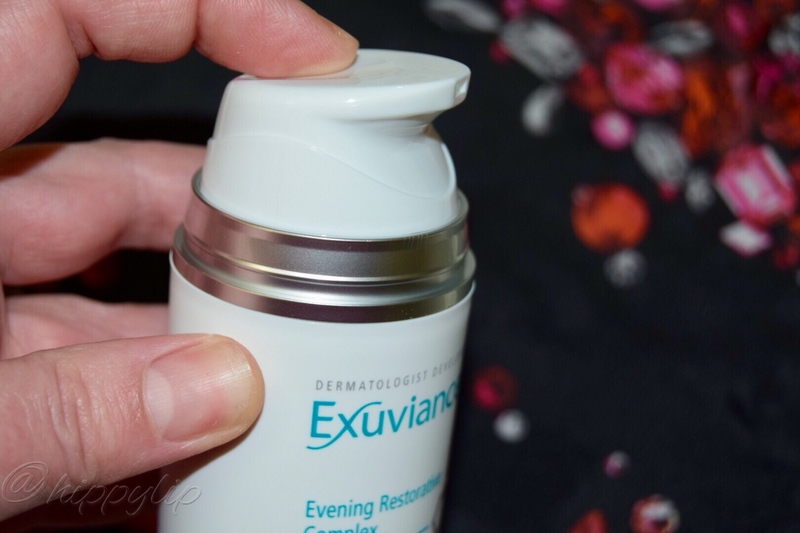 What night moisturizer do you use? Give Me Some Lip! Looks like this is chalk full of good stuff! I’ve never heard of Lactobionic Acid – sounds good, I’m all for pluming the skin! My skin gets a rough texture temporarily too – I think it has to do with changing seasons / fluctuation in temperature. Just a guess. I was using the MAC Studio Moisture cream for night time but once the weather got frigid, I went back to my old favourite, the Shiseido Bio-Performance Advanced Super Revitalizing Cream! I always thought the roughness came from washing too often or switching products but maybe it is the changing seasons. Here we go with MAC again….I need to bite the bullet. I’ve heard and read about your coveted Shiseido cream and I do have a face wash from them that I really like. I feel like my skin becomes tolerant to anything after 2 months or so. Oh no!! Drunk Elephant is very expensive. I only have their Vitamin C serum. I’m curious to see if it works better or the same so please keep me updated. I looked at the Vitamin C serum – I think it’s a good one but I am totally loyal to SkinCeuticals CE Ferulic Serum. It’s F-ing AMAZING. I even have a spare because it’s so incredible. I think (not totally sure) but I THINK they can formulate with the lowest ph of anyone. Drunk Elephant is really close though but SkinCeuticals got a hold of a patent from maybe Duke (not sure of the University) but their serum is between 2.5 and 3.0 ph. So, I religiously fork out a million dollars for the product. I’m actually right in the middle of doing a blog post on C serums. Wow I didn’t know the ph could get that low!! To be honest, I wasn’t a fan of the Drunk Elephant C serum. It’s sticky and I had no results at all. My goal this year is to take better care of my over 40 skin. Lol. Your skin always looks amazing, so I’ll take any advice you have! I’m looking forward to your C serum post. I just logged in to work on my post! With the C serum, you do have to use it daily but you should notice a difference for sure. The ph is pretty low with the Drunk Elephant serum. The SkinCeuticals is definitely something that takes a bit of getting used to. It does absorb and it’s not sticky but it doesn’t smell good. Once you are used to it though, it’s fine and I notice a huge difference with it. My skin changed a lot when I turned 40 and it’s been downhill ever since! LOL it is a constant battle. LIKE CONSTANT! Well, yes and no. It depends on the type of lines and depth and a lot of things. First … it has to be used consistently but it is a more effective form of ascorbic acid than DE because the ph is lower. DE would be my next choice is I couldn’t afford SkinCeuticals. Their ph is 3.3 -3.5 (3.5 is going to be the max for an effective formulation of Vit C whereas SkinCeuticals comes in around 2.5 – 3.0. That’s because they patented the formulation. I have honestly battled lines around my eyes for 2 years. It’s a thing for me. Nothing topical has banished them completely. And they get worse. UUGHHHHHH. I’m 46 and I use botox for crows feet (GOLDEN) but underneath the eye where the skin gets crepey is another issue. I’ve had fat transfer/grafting to improve it and laser resurfacing. Still some wrinkles persisted. Then I hit them with Volbella which is the only injectable “thin” enough that doesn’t swell with water to plump that can smooth fine lines. That was the final straw and the area is now almost completely smoothed. I also can barely afford to feed my children. You have won the battle girl!! Who cares if there is no food. Lol. I thought I was being obsessive and I’m glad to know I am not the only one. I have thought about injections but I have a child in college so I must wait…at least I’ll get my money’s worth, by then I’ll be a crepey mess. What is fat transfer/grafting? I’m a nurse so I understand the term but where is the fat removed from? It sounds so painful. You sold me on Skinceuticals, I think it’s worth the money just for the ph level alone. Why waste money on something that doesn’t absorb well. The battle has just begun! I totally obsess. I read research papers about skin and antioxidants at 1AM. I’m losing it! For sure! The good news is…I have found that Volbella can do wonders for crepey skin. It’s the first injectable that just smooths as opposed to plumps so it works really well in the eye area and it’s been most effective for me with crepey skin. I’ve done it twice and I’ve been super pleased with the results. Fat transfer can be done under general or local anesthesia. They lipo out fat from somewhere like hips, knees, wherever there is some that can go… and process it and then inject it someplace else. A lot of people in Scottsdale (big plastic surgery area) get fat transfer done under the eyes, cheeks, etc if there is a volume loss and they want something longer lasting than fillers or placed in areas fillers don’t necessarily work well. It’s highly customizable so they are like “light” face lifts before the big one might be needed. In my case… they took fat from my knee and also my hips. I was under general so I felt nothing but they will do it under local sometimes. The SkinCeuticals is definitely the gold standard for C serum. The next best one I can find is from Cosmetic Skin Solutions and it’s very affordable. The pH is a little higher 2.8 – 3.0 but I think they are making a good product. It’s the next best I could locate that uses L-ascorbic acid. But the difference between 2.5 – 2.7 where SC comes in … is considered a significant difference. Still I’d say Cosmetic Solutions has great products for much less. But I don’t see them in premier cosmetic surgeon’s offices like I do SC. Haha I do the same thing. I read clinical trials all the time. I think it’s great that you are brave enough for procedures. The fat transfer doesn’t sound too bad but I would prefer general. I obsess too, if you look at my eyes they probably don’t seem bad. I know every little line and they are increasing rapidly, I was actually wondering if something I used made it worse. 2.5-2.7 doesn’t sound like it’s a lot lower but with PH it’s HUGE!! Thanks for all the info. I will check out Skin Solutions but you kind of had me sold on SkinCeuticals. Thanks for stopping by Jodi! I love it, it works great on my skin. It’s extremely mild compared to other moisturizers I own. It’s really been a life saver with this cold weather! Thanks for stopping by! !